Why do we offer 3 ranges of Tool vaults? When it comes to securing tools & equipment often different levels of protection are required. This depends on various aspects such as the value of your tools, how susceptible your working environment is to theft or simply how long you require the product to last. The Oxbox™ is a medium duty range of tool vaults designed for lower risk and lower budget situations, however still providing a good level of security and protection for your tools. Utilising many of the same features of the other 2 ranges including locks, hinge, gas struts and paint finish, we maximize the strength by creating extra folds in the material. Manufactured from 1.5, 2.0 and 2.5mm steel, the OxBox is available in 4 popular sizes and it compares very well with other alternatives on the market. The Tuffbank™ is our most popular range – highly versatile and cost effective. Another market leading brand of tool vaults, offering the best combination of superb quality and excellent value for money. This tough, sturdy range of storage boxes are built to a very high standard using 2 & 3mm steel, boasting many anti-jemmy features which are unique to Armorgard. 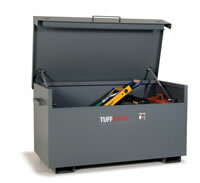 With a range of 9 sizes to choose from, you can be sure a Tuffbank will fit the job! The absolute ultimate brand of site storage safes. When Armorgard began making secure storage boxes, the Strongbank™ was created to provide an indestructible solution for storage of tools & equipment on site. Over 20 years later it is still by far the strongest most robust on the market; nothing compares. Manufactured using 3 and 5mm steel and with every vulnerable area strengthened, this unrivalled product will last you a lifetime and will deter the most determined thief. Use Strongbank for ultimate security. Due to increasing popular demand for larger ‘walk in’ storage facilities, Armorgard have added to their range of TuffStor and FlamStor. Traditionally just available as a fully welded. Theft and vandalism are two problems that plague virtually every construction site. From pilfering of small power tools to theft of heavy duty equipment, these activities cost the construction.